So after over a year of taking a break from my blog, I’ve decided I have to do a special post on my food experience at Noma. For those you not in the know, Noma is commonly thought to be one of the best, if not the best, restaurant in the entire world. It’s held the top spot in the San Pellegrino 50 best restaurants in the world list for a few years and although it recently dropped to number 3 (the horror), I felt that it was still worth a pilgrimage to Denmark for the experience. One of the absolute best things about my life here in London is firstly that I feel like I am in the center of the world and can go to new countries practically every few weeks, and secondly that I have met the most incredible group of people here through London Business School who are totally on my wavelength in terms of wanting to do my favourite things in life: travel and eat. 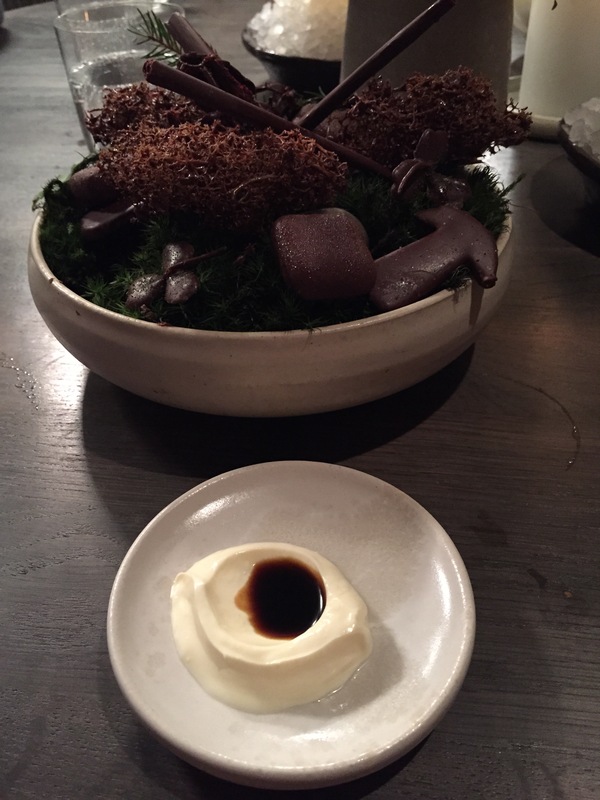 So when I was able to snag a reservation for 6 at Noma (their reservations system is remarkably efficient…love those Danes – you just have to get in an online queue 3 months ahead of when you want to go at a specific time on a Monday), it was obviously worth planning a trip to Copenhagen around this incredible place. Copenhagen itself is one of my favourite cities that I have visited so far in my year of living in London, but that’s off topic, so let’s discuss the insanity of this meal. First course: a chilled berry soup with lemon thyme, and one of the most delightful courses we had. Almost every utensil is wooden and the entire first part of the meal was all vegetables and flowers and fruits. The amount of flavour that they got out of these ingredients (their philosophy is entirely local to the point where they don’t even use olive oil) was unbelievable. Missing is a picture of the bread, which was hands down the best sourdough bread I’ve ever had in my entire life. Full stop. I could have eaten an entire round of this, which came in a fun little felt package along with butter that was so amazing that even I had to sample it. Anyway, just imagine the best sourdough bread you’ve ever had in your life and multiply that by 1000, and that is what the bread is like at Noma. CHECK THIS OUT. Guys, this is cabbage. In a bowl that was obviously hand painted with this incredible seaweed-y sauce. 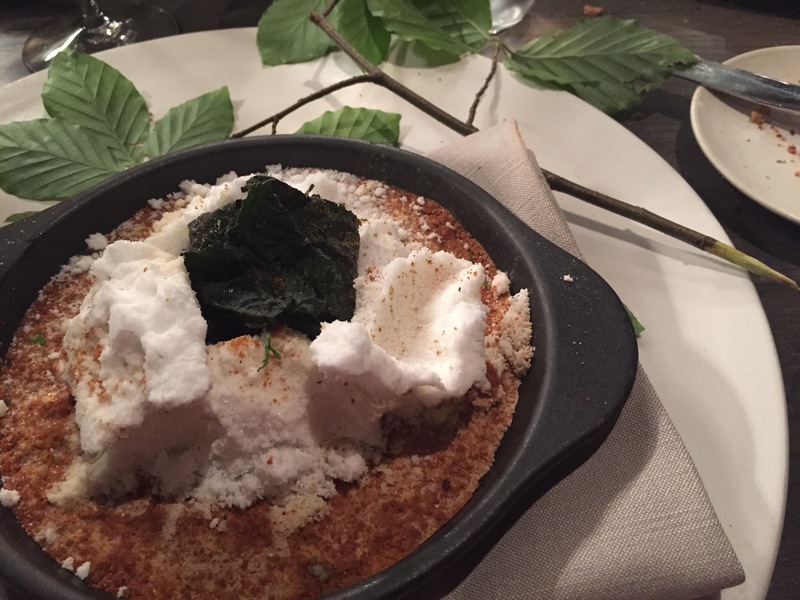 It’s two leaves of cabbage with some kind of seaweed mixture in the middle, and the menu tells me there were somehow white currants involved in the dish as well. I kid you not, this may have been my favourite course of the entire meal (peaking early I know). I cannot even tell you how divine this cabbage was though. I never thought that a vegetable this humble could be elevated to this high a level. 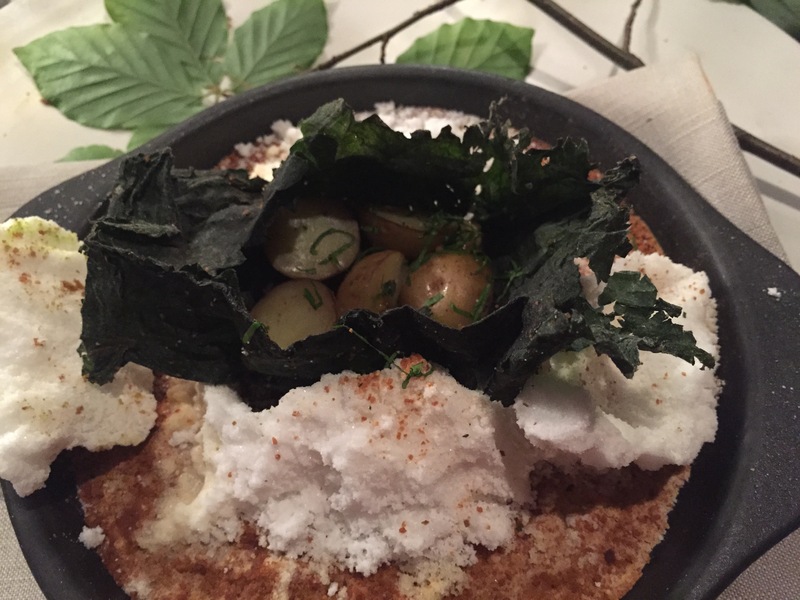 Noma’s version of a casual salad – aka, all sorts of leaves prepared in interesting ways – some crunchy, some soft, some cooked, some not – this was a dream in textures. This was all in a scallop marinade which gave it even more intense savoury flavour. Best salad ever. Getting a little more adventurous now – this was sweet peas, some milk curd, a bit of a seaweed sauce, and that brown stuff on the top is sliced kelp. The peas were actually divine. Apparently some chef intern literally hand shucks ever single one of them and that is their job. The milk curd combined with the seaweed was a little odd but it worked for me. The peas were definitely my favourite part though. An onion. Just casually barbecued on their grill. I really liked this. It was definitely one of the more normal dishes. It was followed by this, which was less normal. 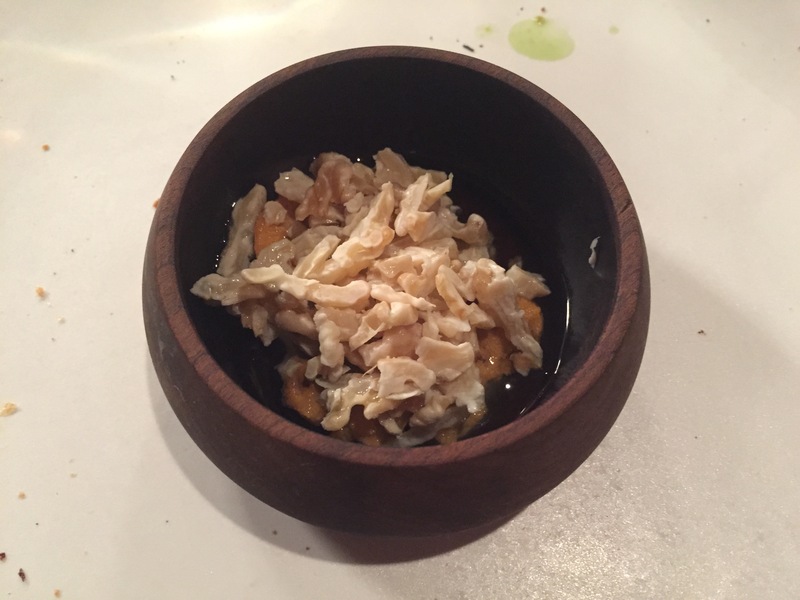 This was raw sea urchin with some shaved walnuts on top. Texture was interesting to say the least. Let’s just say I had a bite or two and passed it along to my wonderful dining mates who would end up eating everything that I could not over the course of the rest of the meal. Ok check this out. It is literally flowers that were found in some (no doubt perfect and beautiful) Danish field, delicately placed on a seaweed tart. The arrangement of the colours and types of flowers was quite impressive. It looks too pretty to eat, but I actually enjoyed the taste as well. This is the work of more chef interns who basically spend all their time foraging in fields for flowers and berries and leaves to be eaten by eager foodies like us. Oh Denmark. This was probably the most ridiculous part of the meal. We were given this branch and a little dish of salt and rocks… And then the nettle leaves in the middle opened to reveal some potatoes, which was the only edible part of the dish, and we had to eat the potatoes with the sharpened stem of the branch. This was incredibly fun but yes, also absurd. The potatoes were delicious though. Next up: little pieces of raw shrimp wrapped in nasturtium leaves. Isn’t it cute how they look like little lillypads? Now, I’ve never had raw shrimp before, but this was a good place to start. Yes, the texture is a bit odd, but it was so cute that I enjoyed it. Continuing the theme of raw seafood, next up was a “mahogany claims and grains” dish. There is one lovely chef who spends his entire life slicing up raw clams into these tiny pieces. These are no ordinary claims – they are found nearby (of course) and are 100 to 150 years old. I ate all of this one too – again, weird texture, but I did like the tiny grains (I believe it was some form of bulgur) located at the bottom of the clam shell. And yes, they rinsed out our special clam shells and gave them to us in boxes at the end because who wouldn’t want a 150 year old clam shell. 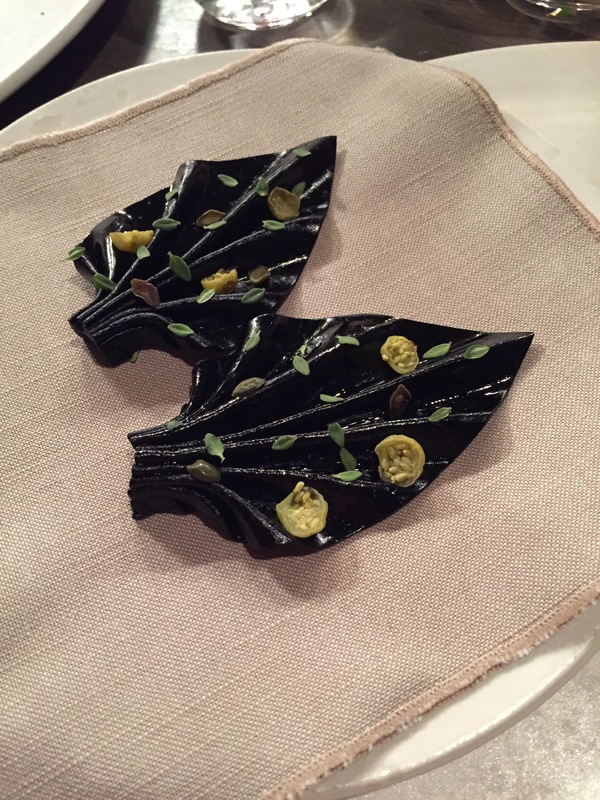 The weirdness continued with this: a piece of pumpkin, rose petals, and a scoop of caviar. They then poured some kind of creamy buttery type soup into the bowl and apparently all these flavours were supposed to work together. This dish was polarising at our table. It definitely did not work for me, but others at our table loved it. So at least it started some conversation. I think the three elements of the dish were interesting and I normally like them individually, but the thick sort of butter soup sauce did not really bring them together in my mouth the way I would have liked. Next up was a lobster course in two parts. 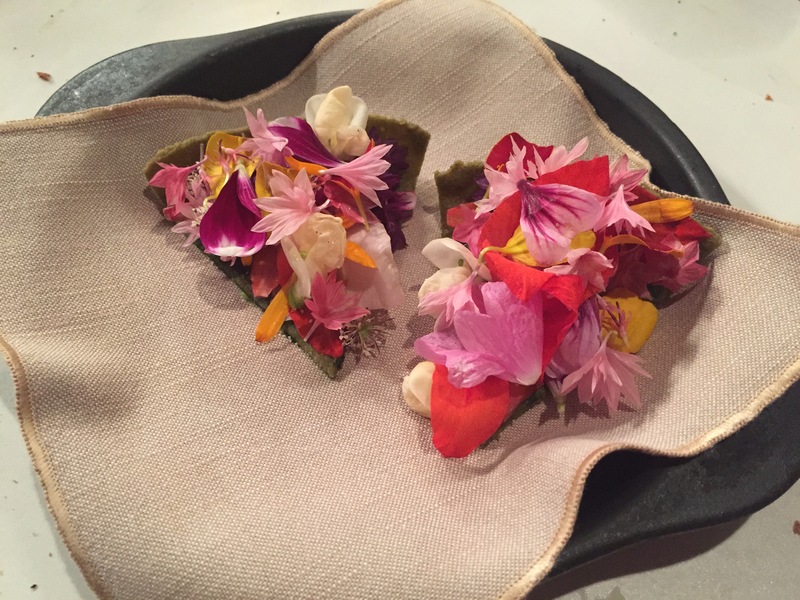 First they gave us some sort of broth that was created from the lobster with a bunch of leaves and flowers on top. I’m not going to lie, I did not enjoy this either. It was weirdly salty. 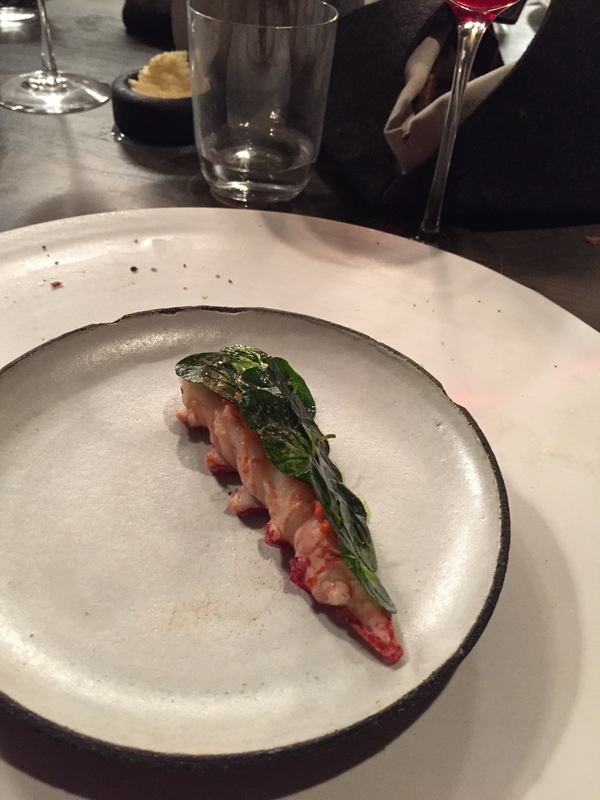 However, I absolutely loved the lobster part itself (with more nasturtium leaves on the top). I think I was also really excited to eat seafood that was not completely raw at this point! Get ready for this one. This beautiful looking fan is created entirely from black garlic, which they somehow boil down and work into a sheet-like form. Think fruit roll-ups (that very American dessert that people ate as kids), but instead of being fruity, it was like a sheet of pure black garlic that they then folded into fans. On the top part were little flowers and herbs, and on the back (not pictured), were TINY ANTS. Yup. They take a sheet of ants, pour liquid nitrogen over them to freeze them solid (and kill them I guess?) and then delicately place them on the back of this fan. Yes, you can see them so this made it a bit less appetising for me. It was also very intensely garlicky, so I really could only manage one bite of this one. But in concept the dish is fascinating! The final course and the “meatiest that Noma gets” was this intriguing play on lettuce wraps. 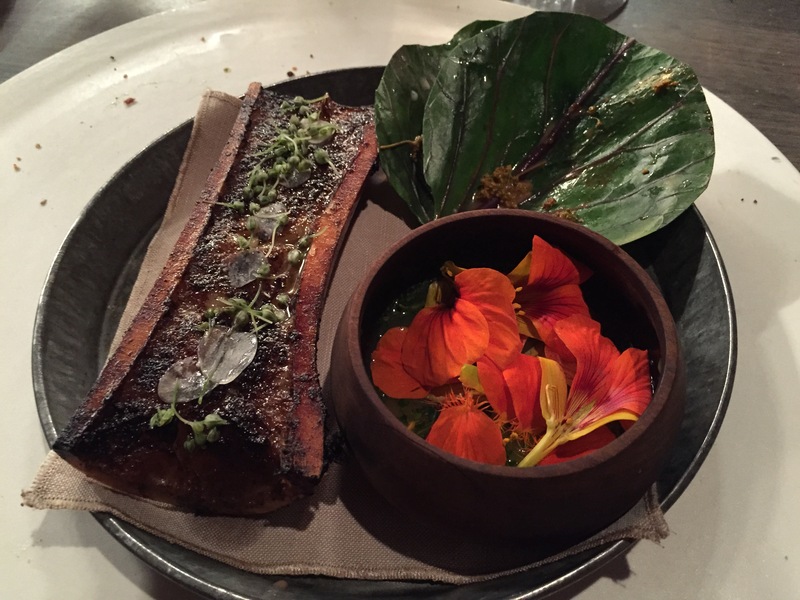 It is roasted bone marrow, flowers, and leaves, and you’re supposed to scoop out the bone marrow, put it in a leaf, and add some flowers on top. Bone marrow is not my favourite thing (it kind of grosses me out to be honest) so I was only able to manage a couple bites of this as well. But I loved the presentation and the colours. Palate cleanser time! 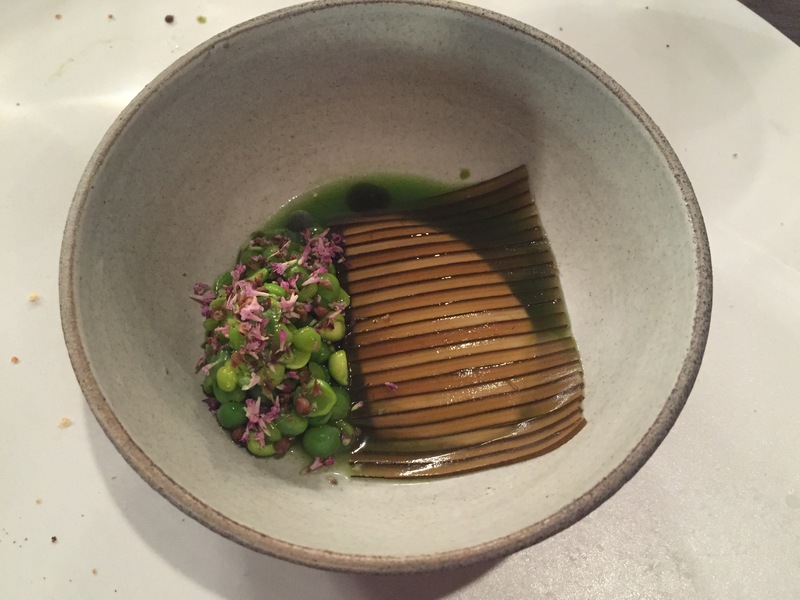 Noma advertises this as berries and greens soaked in vinegar for one year. As pretty as it looks, let me tell you that those cherries do NOT taste good. Or at least not the way that your taste buds think a cherry should taste. I loved the little sharpened sticks that we could use to poke into the nettles (which actually were delightfully crunchy and much more pleasant than the cherries). Rhubarb and sheep’s milk yoghurt with of course more greens on the top. Noma is all about the foraging philosophy in case you couldn’t tell by now. I liked this as I love rhubarb, but was really craving chocolate at this point. Unfortunately, I have to say this dessert was a disappointment. It looked so beautiful and was centred around this incredible sounding berry called the aronia berry which as you can see has this stunning red colour. However, the other part of the dessert was called sol, which is a seaweed based cream, and I believe there was also some sort of truffle mushroom like paste at the bottom of it that was weirdly savoury…it’s not often that I can’t eat my dessert, but I could not manage more than a few bites of this one. But yes! Finally, some chocolate. There was some kind of deep fried moss covered in chocolate, chocolate twigs (wouldn’t have been surprised if they were actual twigs), and various chocolates with some weird liquers inside them (one of which I thought tasted absolutely HEINOUS at the start but then the aftertaste was weirdly good…no idea what happened there). They also made a homemade eggnog type drink which was too rich for me but vastly better than any kind of eggnog you would ever get out of a container in America of course. Afterwards, we were lucky enough to get a long tour of the kitchens and to meet Rene Redzapi himself, which was a perfect ending to an already spectacular evening. 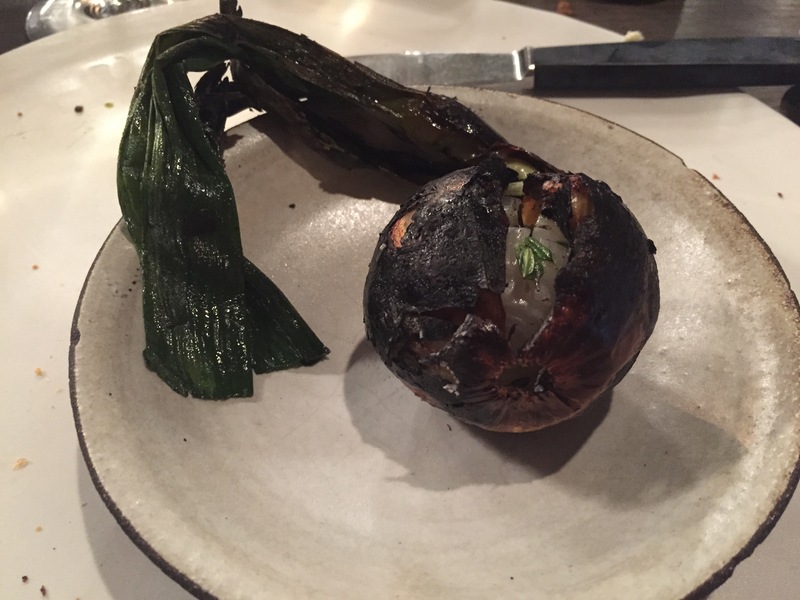 Make no mistake about it, even if the food is challenging and not the best you may ever have, the service at Noma makes it a once-in-a-lifetime opportunity. Working for a luxury hotel group this summer, I was blown away by their attention to detail and how absolutely nothing we did went unnoticed. Service that personalised is an art, and I was incredibly impressed by how genuinely welcoming and warm every single member of the staff was. 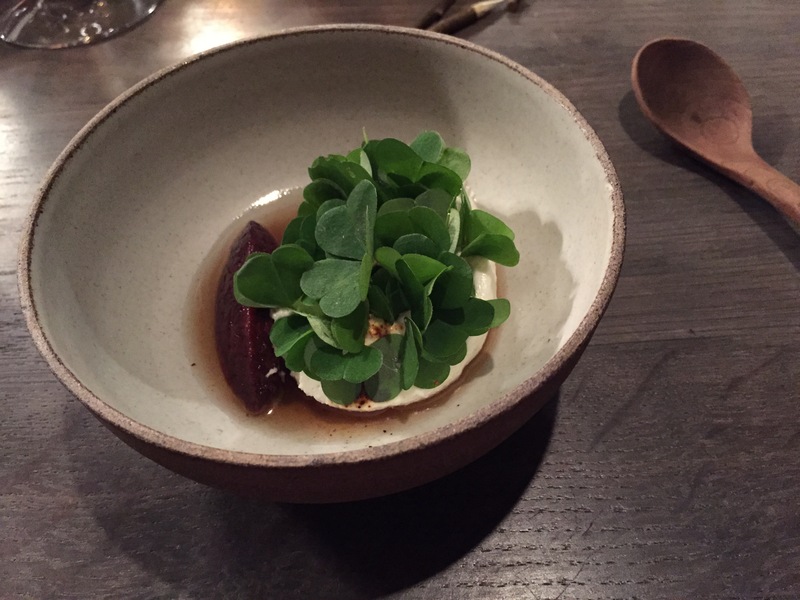 Noma is truly the epitome of a luxury food experience, and anyone who calls themself a foodie or is truly passionate about food as an art form absolutely must put the restaurant on his or her destination list. It was an unbelievable evening that I will remember for a long time to come.